Don’t blame it on the algorithm — assuming you’re designing experiences for “happy, upbeat, good-life users” might make you a terrible person. To show me Rebecca’s face and say “Here’s what your year looked like!” is jarring. It feels wrong, and coming from an actual person, it would be wrong. Coming from code, it’s just unfortunate. But of course, it did come from an actual person. 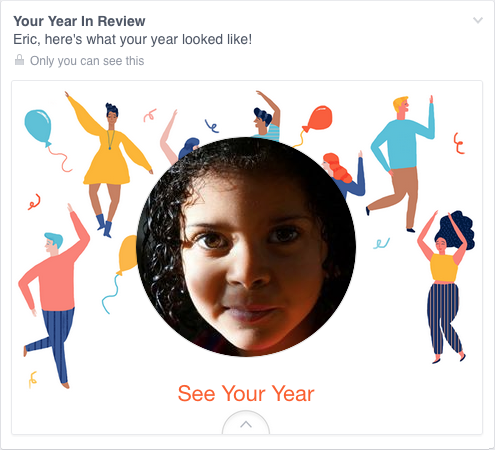 “[The app] was awesome for a lot of people,” the product manager for Facebook’s Year in Review app, Jonathan Gheller, later told The Washington Post. Like all the digital experiences with, and within, which we all increasingly live our lives, an actual person — in fact a whole team of people — was responsible for concepting, designing, building, testing, and iterating this experience. No doubt, the responsibility for the rollout of this particular app featured prominently in a number of Facebook employees’ job performance reviews. From start to finish, this experience was crafted by people (not code). Calling its end result “inadvertent algorithmic cruelty” is like describing a drunk driving accident as “inadvertent gasoline cruelty.” For sure, it could have been avoided with an empty gas tank, but is that really the most accurate way to ascribe accountability in this situation? (Don’t blame it on the algohol). If I could fix one thing about our industry, it would be to destroy the idea that these scenarios are edge cases. Last year in the US, 2.6 million people died, leaving behind untold numbers of Facebook users who mourn the absence of their loved ones. These are not “edge cases.” These are not “worst case scenarios.” These are all people who use Facebook. And that’s not even counting your run of the mill disappointments, broken hearts, and inevitable wrongs and slights and meannesses that are, basically, life. “The design [of the Year in Review app] is for the ideal user, the happy, upbeat, good-life user,” Meyer wrote. But if you are a product manager or UX designer creating experiences that will afflict affect hundreds of millions of people and you are only designing for an “ideal user”… at best that’s just lazy, and at worst — it’s creating LITERAL suffering. The world, obviously, is a manifestly unjust place: people are always meeting fates they didn’t deserve, or not receiving rewards they did deserve for hard work or virtuous behaviour. Yet several decades of research have established that our need to believe otherwise runs deep. Confronted with an atrocity they otherwise can’t explain, people become slightly more likely, on average, to believe that the victims must have brought it on themselves. Hence the finding, in a 2009 study, that Holocaust memorials can increase antisemitism. Or that reading about the eye-popping state of economic inequality could make you less likely to support politicians who want to do something about it. These are among numerous unsettling implications of the “just-world hypothesis”, a psychological bias explored in a new essay by Nicholas Hune-Brown at Hazlitt. If we didn’t all believe that [things happen for a reason] to some degree, life would be an intolerably chaotic and terrifying nightmare in which effort and payback were utterly unrelated, and there was no point planning for the future, saving money for retirement or doing anything else in hope of eventual reward. We’d go mad. Much in the same way that the “just world” cognitive bias can actually lead us to make crueler decisions, designing product features with the “happy, upbeat, good-life” ideal user bias can lead us to create crueler user experiences. “To shield ourselves psychologically from the terrifying thought that the world is full of innocent people suffering,” Burkeman writes, we, as humans, “endorse policies more likely to make that suffering worse.” And by denying the full spectrum of the realities of people’s lives, awesome and tragic, we, as experience designers, do the same. Except we’re the ones with the power to actually do something about it. Or how about just, you know, design. 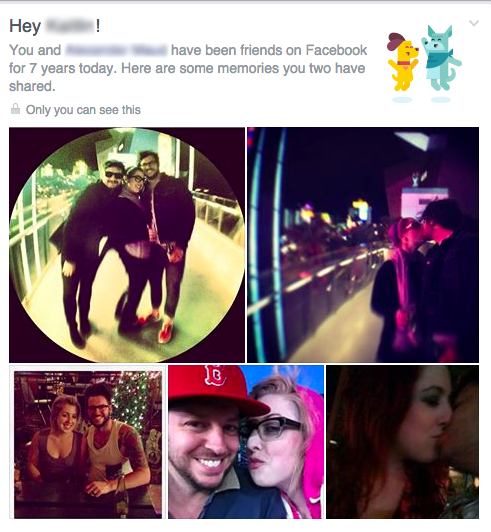 But four months later, Facebook’s photo collage assault on my friend suggests perhaps they don’t really think they can.